Want to make healthy homemade mayonnaise for yummy recipes like my Keto Dinner Rolls… yet avoid that strong extra virgin olive oil flavor? 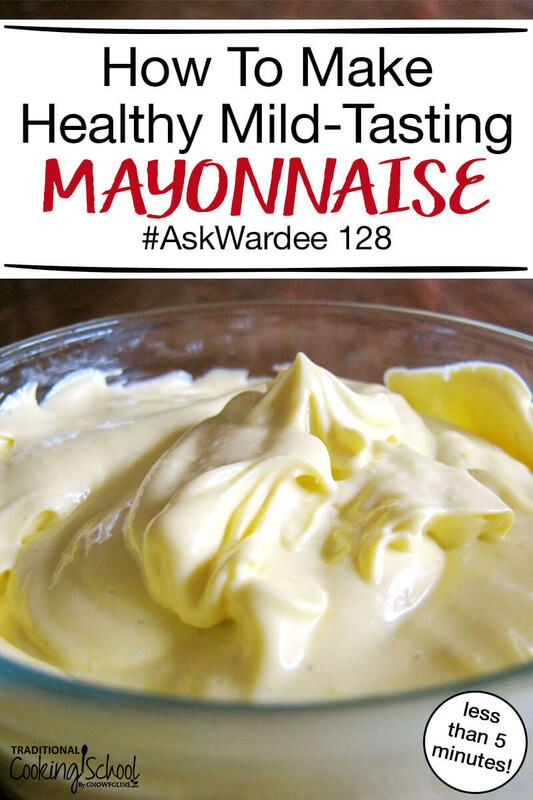 I'm happy to share how to make a mild-tasting homemade mayo… without fancy kitchen equipment… on today's #AskWardee. The Question: Make Homemade Mayonnaise With Avocado Oil? Deb, thank you for your question! The basic recipe for mayonnaise is simple: mix together 3 room temperature egg yolks with some salt and raw apple cider vinegar. Optionally, you can add mustard, garlic, etc. for flavor. Then, while blending or whisking*, drizzle in 1 cup of oil(s). If all goes well, it should emulsify into mayonnaise almost like magic! *Use a stick blender, food processor, or blender. 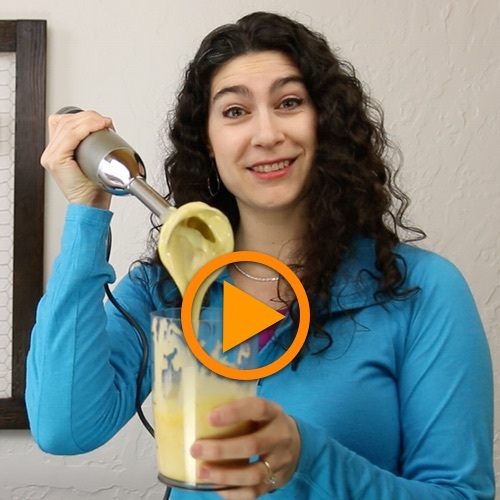 You can whisk by hand, too; it's harder but it still works! Any liquid oils work for mayonnaise. However, Deb asked which are the healthiest oils to use. We prefer to use healthy traditional fats/oils — organic and cold- or expeller-pressed — like extra virgin olive oil, melted coconut oil, and/or avocado oil. However, olive and coconut tend to impart stronger flavors into the mayonnaise. That is, unless they are more refined; more refined often equals a mild flavor. Unfortunately, though, refinement also equates to less healthy. So a really good choice for mild-tasting mayonnaise is organic cold- or expeller-pressed avocado oil. It's actually the only oil I use for my basic mayonnaise recipe now! (Although I often add a titch of toasted sesame oil for flavor.) We really, really love it. Here is my recipe for homemade mayonnaise (originally shared here). In it, you'll see I call for a blend of expeller-pressed oils. It's your choice, but do follow the guidelines I shared above if you want it to be as healthy as possible. These days I use nearly all avocado oil, with just a bit of toasted sesame oil added for flavor. Make your own more-delicious, healthier, and less expensive mayo in just a minute or so with a few common real food ingredients you probably already have in your kitchen. I'll show you! Watch the video above to see this recipe in action. You can use a food processor or blender. Or a stick blender and a quart size jar works great. Combine all ingredients, EXCEPT oil, into a quart jar or blender. Now keep blending while slowly pouring in the cup of oil. Before long (in just a minute or so)... you have mayonnaise. *In the video above, I'm using avocado and grapeseed oils. Beautiful, healthy, delicious, cheap, and EASY. Wasn't that amazing and oh-so-easy? What If Your Mayonnaise Doesn't Work? Sometimes — usually because of poor quality eggs or egg yolks that are too cold — your mayo won't emulsify (thicken). It stays liquidy and runny, like the oil that's added. It may even separate after being in the fridge for awhile. It's simple to fix this! Get out 3 more egg yolks and let them come to room temperature. Then, while blending, slowly add the liquid mayo mixture that didn't work. It should emulsify this time, provided you are using room temperature, good quality egg yolks. What Do To With The Egg Whites? Egg whites are useful in lots of Trim Healthy Mama or Keto recipes… such as my Keto Dinner Rolls! There's no waste when you use your yolks in sauces like mayonnaise and your whites in other dishes! This mayo is made with only real food, healthy ingredients… so it's a perfect addition to your Traditional Foods, Paleo, Whole30, or Keto recipes! We love it on top of grain-free salmon patties, in egg salad, in homemade ranch dressing*, on sandwiches, and more. *I shared our favorite homemade ranch dressing recipe in the June 2016 Thank You video for members. If you're a member and don't have it, email me at wardee at AskWardee dot tv and I'll give it to you! 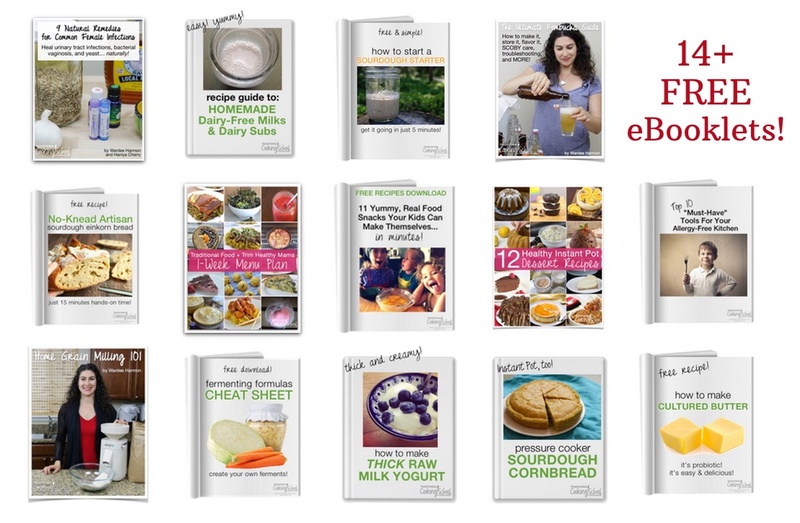 Do you make homemade mayonnaise for Traditional Cooking, Trim Healthy Mama, Keto, Paleo, or Whole30 recipes? What oils do you use in homemade mayo? I see that you use grapeseed oil in this recipe. I have read on the Westin A. Price Foundation website that grapeseed oil is high in omega-6 fatty acids and should be avoided because we already have so much in our diet. Would you please explain to us why this is something you would use for your mayonnaise? Hi Brenna. I actually don’t use grapeseed oil anymore for that reason. As I shared in this episode, I use nearly all avocado oil with a bit of sesame oil for flavor. I’ll be sure to update the original recipe so it’s current with what I do now. Thank you for asking! Thank you Wardee for everything. I can always trust your recommendations!! Use a wide-mouth, quart-size graduated Mason jar. Add oil to the 1 C line. Add egg (straight out of fridge is fine), salt, and lemon juice. Put your immersion blender into the jar, all the way to the bottom. Turn on the immersion blender, and slowly pull the stick up. The oil should immediately emulsify. I usually move the immersion blender up and down slowly for about 45 seconds. I’m glad you found a recipe that works for you! Thanks for sharing! The trick here is to keep the stickblender submerged for about 15 seconds before starting to move it up and down. Works like absolute magic! No more crazy dribbling the oil in nor dirtying a measuring cup for the oil! I make home-made mayo, but I use the whole egg, not just the yolks. It eliminates the problem of what to do with the leftover whites and you don’t need to use as many eggs. I usually only use one or two. My mayo emulsifies just fine, though I find that the oil I use will affect the texture. Sesame oil tends to make a thicker mayo, but also has a very strong flavor. Pure coconut oil will make the mayo stiffen hard in the refrigerator, so I usually mix it with other oils like avocado or sesame. Recently, I bought some liquid coconut oil and plan to try mayo using that at some point. I have even used a mixture that included some melted butter when I was short of other oils. Are there health risks from eating the raw egg yolks in homemade mayonnaise? If so, is there any way to make it safer? Thanks! The only sure protection against salmonella/botulism is to use nitrates/nitrates. Fermenting doesn’t kill these disease causing organisms. Hi Wardi and Jennifer, I have also been making Mayo similar to the method Jennifer uses, 1 or 2 whole eggs (whites and all) and they always turn out well. I do use Mustard and Apple Cider vinegar but I really like the tang so I put in a heap more. I also add herbs and spices if I want different flavours. I really like the garlic flavour. Using white with the egg parts a stiffer texture than simply yolks. Sometime I add one whole egg and one yoke to find the balance in texture. I make mayo with extra-virgin olive oil. It has a strong taste but I cut it with Greek yogourt or with partially strained kefir. Hummmmm. I use lite olive oil, processed but its a good oil to start with, unlike the alternatives. Refined coconut oil is too pricey for what it is. Lite olive oil is pretty fair.